This long sleeved T breaks a number of common sense rules for gents beyond a certain age (aka me). The long sleeved T has never been a staple, as there is more than enough scope between the t-shirt and sweatshirt for any eventuality imho. Furthermore, common sense dictates that the slogan T shirt or sweat is the domain of the young, rather than the young at heart. That said, I’m a fan of this long sleeved tee by FPAR. The brand itself is part of an ongoing return for FPAR (or Forty Percents Against Rights), by renowned Japanese designer Tetsu Nishiyama, founder of WTAPS, and fits with my fondness towards Japanese brands as some of my favourites (even the labels on Nanamica pieces are like poetry). 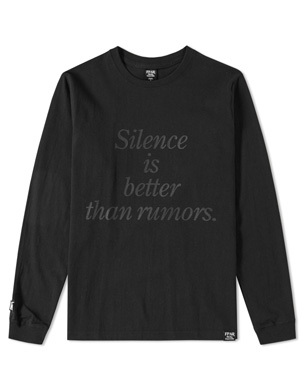 I’ve recently succumbed to the ‘Courage’ sweatshirt in their S/S collection, and truth be told likely won’t buy this, if in part because they’ve mis-spelt ‘Rumours’ (curse you Noah Webster).